Yesterday’s mail brought something beautiful: Cobalt’s Volume 3, with its robin’s egg blue cover and pretty interior design and especially its content—oh, the words in there. You want this. It includes my creative nonfiction piece, “Believe It, She’s Tried.” It’s about the novel I wrote and almost published, the years I didn’t write at all and how the words returned. It’s about celebrating the fact that we are writing and publishing, even if we receive few rewards beyond the relief of expression. Of saying out loud, as it were: “Hey, this is me.” It’s about divorce and why I hate the movie Forrest Gump. 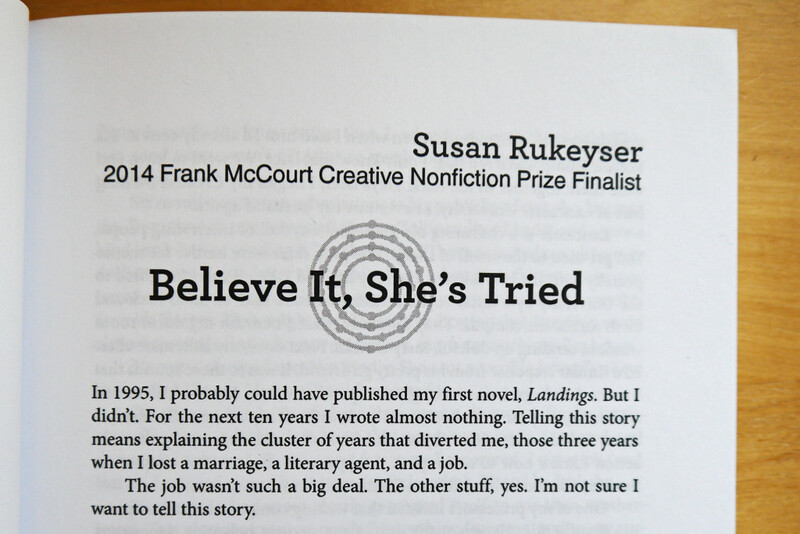 “Believe It, She’s Tried” and its publication will always be especially important to me. Exactly two decades after the events described, I was able to confront disappointment and mistakes and finally, finally let them go. Writing this piece effected change, I truly believe that. It shifted the air. Very shortly after Cobalt named it a finalist, I learned that my novel Not On Fire, Only Dying had been accepted for publication with Twisted Road. Just as I’d made genuine peace with the possibility that I might never have a novel published. And it would be okay. I would be okay. I’d keep going, which is all that any of us can do. Keep going, keep writing. Stay hopeful but flexible. Dreams adapt on their way to coming true. Forgive yourself. Celebrate other writers’ success. Celebrate your own. Be grateful. Breathe. Believe it.